Conventions are time consuming and expensive, but these are the ones I’ll be at this year. At first I thought I’d be sharing a sharing a table with Donovan Yaciuk (Spacepig Hamadeus) and Justin Shauf (artist, Spacepig Hamadeus & Canadian Corp.), but fortune smiled and I got my own table (thanks to Andrew Thomas). I missed the inaugural Prairie Comics Fewtival last year, and I was unbelievably bummed (even though I had a blast at my cousin’s wedding). No such conflicts this year! 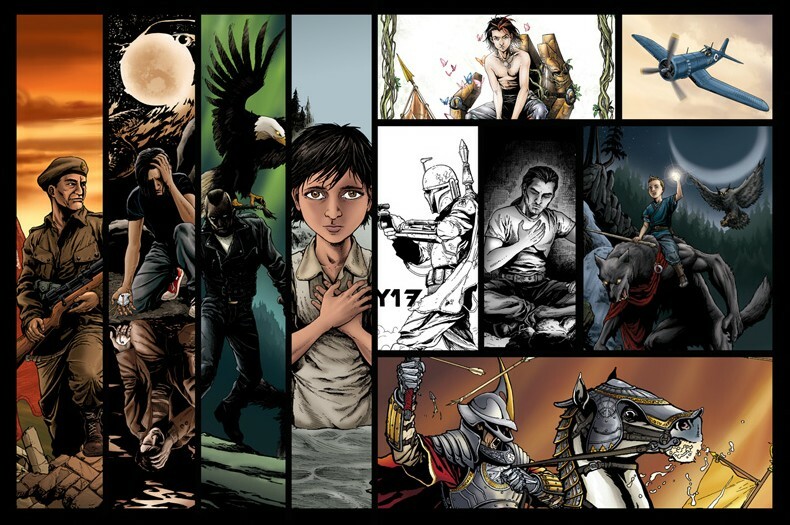 The PCF showcases prairie comic creators—all original, creator owned content! And did I mention that it’s free? Not to put too fine a point on it: Free. Meet comic makers. For Free. (But don’t forget to support those comic creators). I will also be on a panel at PCF: Comic Layouts. C4 is my go to convention. It’s local. It’s the biggest in Winnipeg. I get to hang out with all my local creative types (when I’m not “stuck” at my table). And C4 graced me with the Story Teller Award last year, so that’s always awesome. As at all conventions I will have copies of all the books that I’ve worked on (7 Generation, Tales from Big Spirit, A Blanket of Butterflies (Eisner Nominated), Fire Starters, and The Chronicles of Era. I also have a few prints, and am always open to sketches, and similar commissions. And there is always free stuff too: my Thank You cards, bookmarks, and maybe my preview for The Chronicles of Era Book 2. The Chronicles of Era Book 2 will be printed at the end of April (in time to Calgary Fan Expo and Prairie Comics Festival). Two books I illustrated—Betty: The Helen Betty Osborne Story and A Blanket of Butterflies—have been nominated in the new Graphic Novel category at the Manitoba Book Awards. The best of the best will be awarded on April 22, 2017.